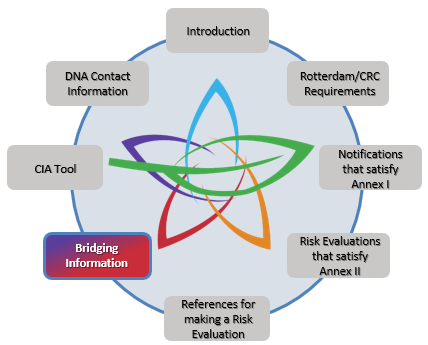 The concept of ‘bridging information’ holds where the risk or hazard evaluations and exposure assessments completed in one country may be used by another country in support of its notification of final regulatory action submitted in accordance with Article 5 of the Rotterdam Convention, as long as both countries have similar local conditions. At its first meeting, the CRC considered a working paper on bridging information that would be used by the Committee to judge the acceptability of a notification of final regulatory action where the notifying country had used a risk evaluation from another country or international body as the basis for its national decision. As noted in paragraphs 33–35 of the report of that meeting (UNEP/FAO/RC/CRC.1/28), the Committee adopted the paper on the understanding that it would be applied on a case-by-case basis and that it would be developed further in the light of future experience. At its third meeting, the Conference of the Parties to the Rotterdam Convention considered the issue of risk evaluations carried out under other multilateral environmental agreements and their relevance to candidate chemicals under the Rotterdam Convention. During those discussions, several representatives pointed out that the current guidelines on bridging information would need to be developed further in order to accommodate the consideration of global risk evaluations as experience was gained. As noted in paragraphs 63–66 of the report of that meeting (UNEP/FAO/RC/COP.3/26), in the light of the views expressed, the Conference endorsed the approach recommended in the Secretariat’s note (UNEP/FAO/RC/COP.3/10), including its stipulation that, in order to satisfy criterion (b) (iii) of Annex II to the Rotterdam Convention, bridging information providing evidence of the prevailing conditions in the notifying country would have to be submitted. At its third meeting, the CRC considered the bridging information document contained in document UNEP/FAO/RC/CRC.3/4. The CRC amended the document, which is now contained in section 2.2 of the Handbook of working procedures and policy guidance for the Chemical Review Committee. This document provides guidance on the sort of information that will be considered by the CRC in determining that the conditions in the country which completed the original risk evaluation and exposure assessments are similar to and compatible with those in the notifying country. For those countries whose national regulatory programmes require the use of risk evaluations but which lack the capacity and resources to perform such evaluations, this guidance may also be of interest. It is important to note that when a Party submits a notification of final regulatory action, the risk evaluation and the “bridging” information must be sufficient to fulfill the criteria in Annex II (b) (iii) for this notification on a chemical to be further considered by the CRC under the Convention. The use of this guidance is intended to be voluntary, and should be interpreted flexibly. The information should also be sufficiently detailed to enable the CRC to make an assessment. It would be pertinent that the scientific information on risk evaluation is originated from a country with similar local conditions to the country using the risk evaluation in support of its decision for a final regulatory action. To support DNAs in their search for risk assessments, a webpage is available showing the countries in each PIC region that have already done risk assessments acceptable according to the CRC process. DNAs may contact the DNAs from these countries, where applicable, to obtain information on risk assessments to be used in their decision-making for a final regulatory action.